The temptation to lift my hands from the handlebars overcomes me when I freewheel down towards the border crossing, arms outflung, free and more than just a little irresponsible. My guide, Patrick Muyunda, doesn’t approve, but he laughs as we stop for a break at that place where the mighty Zambezi River meets the road. 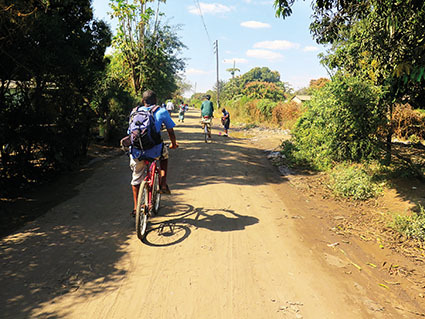 I have joined him on a bicycling tour around Livingstone and we’re halfway through the roughly 35 km route, which winds between the town and its more rural surrounds. Muyunda is young, maybe 20, and has been guiding tourists since he was a mere 12 years old. Self-taught in both English and bike maintenance, he would have made his mentor, the late Cliff Sitwala, very proud. Public transport is uncommon here and cars and motorbikes are expensive, which means most travel is undertaken on foot. Ever aware of this – and the fact that no schools had been established on the town’s newer, western side – Sitwala was inspired to use the revenue from his tours to open the Cowboy Pre-School in Dwamba. From one classroom in 2003, today there are six classes for children from three to 12 years old, as well as an adult-literacy programme. Visiting the school is a tour highlight. I didn’t know any of this when I signed up. At the time, I could think of nothing but the uninterrupted joy of wind in my hair, dirt roads and new discoveries by bike in a town famed for its wonder of the world: Victoria Falls. Founded in 1905 and named after the Scottish explorer Dr David Livingstone – the first documented white man to be shown Mosi-oa-Tunya (The Smoke That Thunders) – today Livingstone is a rich mix of craft producers, colonial architecture, museums and traditional village life – all of which fit naturally alongside the backpackers and five-star lodges. Here, at the heart of Zambian tourism, scores of local entrepreneurs and excited tourists all help fuel the town’s vibrant atmosphere. I’d met Muyunda at the Livingstone Museum, where he’d matched me to an excellent ride and we departed towards Linda, before heading to the more rural Libuyu and Maramba suburbs. For the duration of the ride, slivers of silver paper caught my eye as they fluttered off the trees – a precaution against elephants, I was told. The whole area lies within the Mosi-oa-Tunya Game Reserve and elephants trundle through every night. The papers and loud noises have been adopted as means to keep them out of the gardens. There are more than 70 tribes in Zambia, each one with its own language and cultural variances, though, in recent years, intermarriage has brought people closer together, bridging the divides. We pass some substantial government-built houses in Linda before moving into the poorer, more remote areas where houses are constructed of mud and have straw roofs, and livestock roam the street. All is charming, clean and neatly kept. While at a working quarry, I meet the diminutive Doreen, 94 years old, who spends her days chipping away at rocks to prepare stone for the building industry. It’s pretty gruelling work and I give it a go, but I am not very skilled, much to Doreen’s amusement. The aim is to fill a wheelbarrow daily, which potentially fetches US$1 at the market. It’s a hard life and she’s not alone. The quarry has about 20 women scattered around, legs and arms protected from sun and stone, chatting as they labour. This is seasonal work – during the summer, the rains fall and they work the land. From here, it is on to the tarred road towards Victoria Falls. Traffic increases and we make way for minibuses, trucks, safari vehicles and cyclists – many of them crossing over into Zimbabwe from Zambia to trade goods. We make time to soak our feet in the Zambezi River and to admire an ancient and mystical baobab tree before heading to Dwamba and the Living Falls Biopower project. There are hippos and crocodiles about, but we stop next to one of the lakes to learn how air- and watertight hyacinth is transforming the local sewage into usable gas. After a heartwarming visit to the Cowboy Pre-school, we park our bikes at the Dwamba local market. There is nothing touristy or fake about this place where the locals shop. Traders display their fine fare: dried fish, live chickens, various meats and mopane worms for sale. There are also stands selling gorgeous African fabrics that I can’t resist, generator-powered fridges offering ice-cold sodas and piles of cheap Chinese shoes and electronics, which seem oddly out of place. I could linger here and leave prints and conversations, but there is a call to end the day and we get back in the saddle for the 15-minute cycle back into town. Throughout the morning, children run out to greet us, shaking hands, and it gets me thinking as I pedal on: this is possibly one of the friendliest, most welcoming areas I’ve spent time in. Exploring by bicycle with a knowledgeable guide and open-hearted approach has given me a true feel for Livingstone and its people. As I park my bike and say a warm ‘Goodbye, and see you soon’ to Muyunda, I think of Rudyard Kipling’s comment, ‘The first condition of understanding a foreign country is to smell it’, and I realise that the Local Cowboy Cycle Safari Tour has given me the opportunity to breathe in a little piece of Zambia. 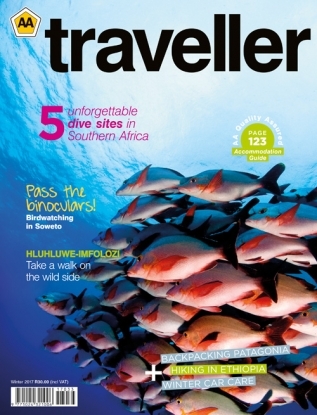 • Victoria Falls is the key attraction and a must-see from the ground. I’d also recommend taking in an aerial view, by either helicopter or microlight. 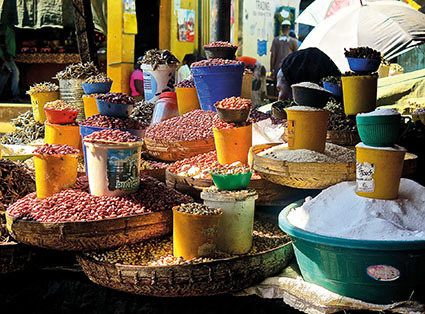 • Get a feel for the town itself with a visit to the Livingstone Museum and the Maramba and Salaula markets,which sell everything from fresh fruit and veg to second-hand clothes. • If you’re not doing the cycle tour, you can arrange a visit to a local village to learn more about life in Zambia. • Enjoy game viewing from the water with a sunset cruise on the Zambezi (where elephants, buffaloes, hippos and crocodiles can be spotted) or a canoe safari on the upper Zambezi River. 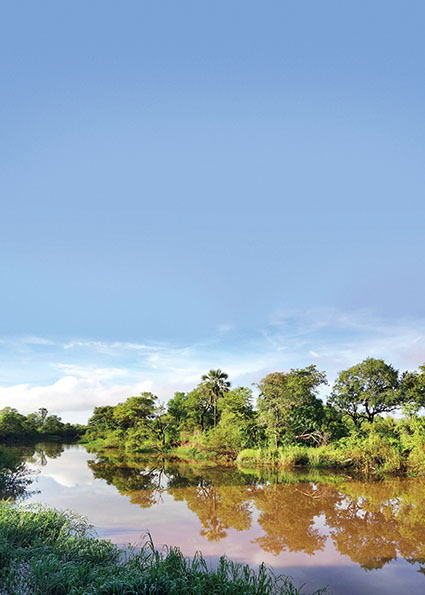 • A game drive in the Mosi-oa-Tunya National Park in an open 4×4 safari vehicle is difficult to beat. 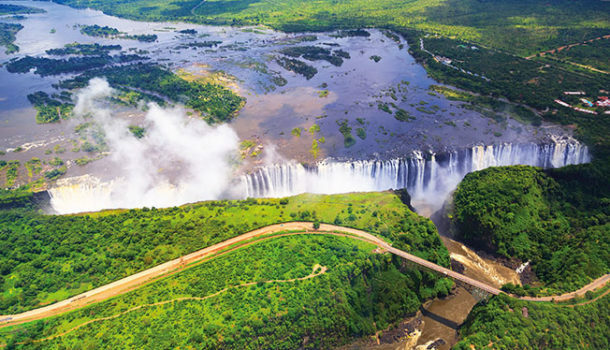 • Anyone wanting an adrenalin rush can book a bungee jump or big swing from the Victoria Falls Bridge. There’s also abseiling above the Batoka Gorge and impressive whitewater rafting on offer only 3 km away. • High tea at the Royal Livingstone Hotel, on the deck overlooking the Zambezi River, is a must! A four-hour tour is currently US$25 pp, and groups of one to 25 can be accommodated. It’s best to pre-book. A moderate level of fitness is essential and you’d do well to have sunblock, a good hat, plenty of water and comfortable cycling shorts or trousers. To find out more about Local Cowboy Cycle Tours, visit www.facebook.com/LocalCowboyCycleToursBikeHire. Or you can contact Oliver Sikatumba, director of the Local Cowboy Pre-School, and also one of the guides, on +260 97 774 7837 or oliversikatumba@rocketmail.com. Victoria Falls is spectacular all year round, but it’s most impressive between February and May when water levels are highest. By contrast, the dry season of October and November is best suited to the heat-seeker, with June to August offering the best of both worlds.